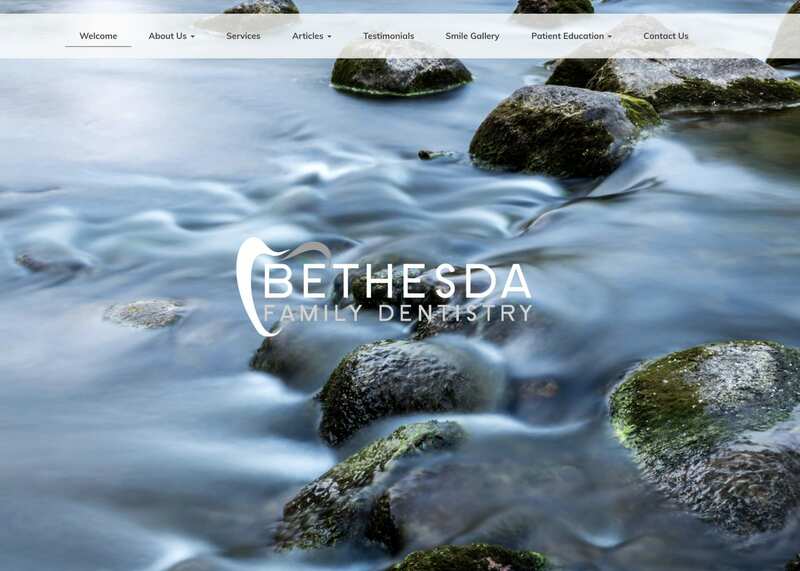 Visitors to Bethesda Family Dentistry come into a site that immediately gives impressions of serene minimalism. This site serves as an excellent approach to visitors who are looking for a blend of simple dental website design that still assures them of the skill and clinical hygiene they’ll get during a visit. Overall, the page sets you at ease, delivers the information gently, and guides you to submit information through the form located at the bottom. The bits and pieces of this design come together to effectively deliver an atmosphere of a peaceful and reassuring clinical atmosphere. The light colors, particularly the white base, speak of purity and cleanliness and delivers these ideas straight to the viewers subconscious. With this message comes one of simplicity and a straight-forward approach, assuring the visitor that the professionals this site represents will not attempt to add any sort of unnecessary procedure. For the patient who enjoys a low-pressure sales situation and desires a doctor who will help them resolve their concerns with clear, direct treatment free of frills this site will be very appealing, as will the business it represents. The light tones throughout the page represent a gentleness of approach, softly presenting information and allowing the viewer to decide which of these options are right for them. The brightly colored pictures of the patients demonstrate that the patient is the center of the visit, and also provides a stimulating effect that inspires the viewer. The blue tones selected as a backdrop combined with the warmth of the models features draw the eye while sending a reassuring vibe to the patient. These are happy customers who have gotten the help they need and are pleased with the results and the contrast, rather than being jarring, is instead captivating. The overall design is very minimalist, especially as pertains to the text. To the viewer, this provides a set of clear options without incorporating a high-pressure environment. Nothing on the page presents a hard sell or implies any form of persuasion, telling the viewer that all the decisions are in their hands and the practitioner is merely there to assist them in making their choices. The easily accessible links at the top are present but not ostentatious, while the form at the bottom says “We’re glad you’re still here, can we help you further?” just as gently as the rest of the site presents its information. Much of this has been stated previously, but to recap this is a very low-pressure sales environment that none-the-less is full of subtle elements intended to direct the viewer to select the services they want and choosing this practitioner as the right one for them. This can be an incredibly effective technique, especially when combined with the choice of bright colors in the patient photos that offset the otherwise down-played colors on the site. This dental website clearly presents a calm and quiet business office and a practitioner who listens to their patients. Even as the remained of the site’s imagery is downplayed the pictures of their patients is brightly colored in blues, whites, and yellows. Blue is a comforting color associated with trust while yellow exudes an air of positivity and happiness. These two colors in combination make the viewer feel good about the site and the staff they’ll work with when they go to the practitioner’s office. Overall it’s an excellent dentist office website design for targeting patients who may experience nervousness and who simultaneously desire to avoid high-pressure sales while receiving the direct information they need to guide their care.